Zara Home, the fashionable home brand, a subsidiary of the INDITEX Group, is making its Dubai E-Commerce debut on September 7th at WWW.ZARAHOME.COM . The product range at Dubai online store will feature home textiles: Bed, bath and table lines, in addition to select furniture, tableware, cutlery and decorative accessories, including loungewear and gift items. Zara Home opened its first store in United Arab Emirates on 2005 and offers the latest trends in interior decoration. A diverse and international team of designers, with a unique vision, has made Zara Home the brand that transforms interiors into warm and fashionable spaces. Dubai clients will find on the online shop all the range of products of the different seasonal collections introducing new additions weekly and monthly, look books and videos. Shopping is also possible using the official APP available on both IOS and android devices. 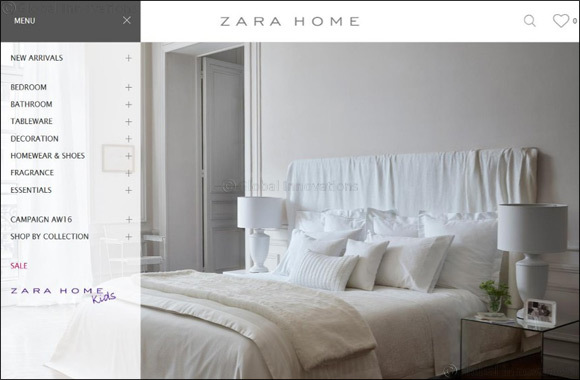 Visitors to WWW.ZARAHOME.COM will be able to subscribe to a newsletter that shares the latest news of the brand. A specialized toll-free customer service will also be available by email and telephone (800-9272-4663 / INFO.AE@ZARAHOME.COM). All Major credit cards will be accepted at WWW.ZARAHOME.COM, shipping and handling charges will be based on each order. And as a special welcome for the Dubai market, all the customers that subscribe to the newsletter before September 7th, will get a 10% off on their first purchase. Also, all the clients will enjoy free shipping on the website during the first week of launching. Zara Home is the home furnishing brand of the INDITEX Group. It began as an innovative project to bring fashion into the home. Two collections are launched each year to adapt the seasons top catwalk trends to home furnishings. These collections reach thousands of customers all over the world through a fundamental asset: our shops. Their strategic locations in the world’s largest cities, their layout and product display, the scent music, lighting and window displays are the best possible showcase for our products. The first Zara Home store was opened in Marbella, Spain in 2003. Today the brand is present in 60 countries, with more than 500 stores and more than 6,000 employees, Zara Home has grown strongly over the last ten years. In 2007 online shopping was launched, becoming the first INDITEX Group chain to venture into internet sales. Mission Statement: we exist to provide our customers and people with an entertaining and exciting way of life.